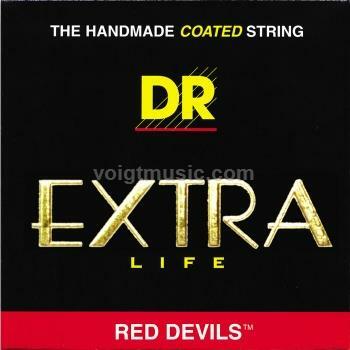 Red Coated Electric Guitar Strings on Hexagonal Core DR’s EXTRA-Life strings offer players a superior coated strings without sacrificing the crisp tone, clarity, and volume of traditional DR HandMade Strings. EXTRA-Life is a super thin advanced .0003” coating on the plain strings and on the wrap wire. Advanced coating for “EXTRA-Life” and Protection.